Earlier today I was going thru my google alerts and found this delightful write up about my last show. Thought I would share...i get all warm and fuzzy when I read about people liking my stuff. A big thanks to the author of this review, it really inspires me to keep it up! A few days ago we mentioned an artist by the name of Lana Crooks during a review of Rotofugi Gallery’s latest group show, “My Kind of Town: Chicago Artists Group Exhibit.” Little did we know that Crooks would be conducting her own solo show, “Trophy,” at OHNO!DOOM’s Gallery a day later. It goes without saying that we held a certain size of excitement for the soft sculpture artist, especially after viewing one of her pieces a day earlier, and we weren’t let down one bit. Crooks embellished the usually dull space of the gallery by taking us into her world with a constructed faux fireplace complete with a vintage inspired wallpapered wall. Above the mantle of the fireplace hung a soft sculpted buck with a few spools of yarn entangled throughout its antlers. It was the theme of taxidermy that gave Trophy its charm, and the extra amount of detail with fabric covered mounting boards are what gave it its elegance. Unlike other popular soft sculptors, Crooks was able to successfully convince the audience that her style and craft had merit and relevance in the increasingly growing field by using mystical creatures for the subject matter and allowing our imaginations to bridge the gaps when needed. She also had a few collaborations with artists: Max Bare and Shawnimals, both of which displayed work with her previously. Seamless in conception and execution, her collaborative work proves just how much of a grip Crooks has on her medium and how aware she is of the places it could go in the contemporary art world. If you missed the opening don’t fret, her work will be hanging in OHNO!DOOM’s Galley for a few weeks, so come on down with a coke and a smile…your inner plush monster will thank you. The original article can be found here. 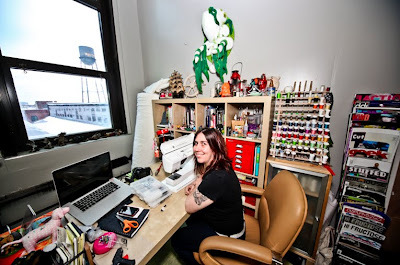 following it is another article with another great write up on Rotofugi's My kinda town show.